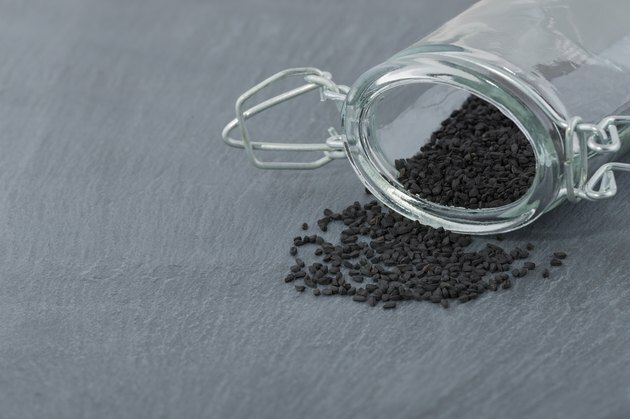 The seeds of the Nigella sativa plant, more commonly known as black seeds or black cumin, are a flavorful food additive that may have medicinal benefits. Health professionals with Memorial Sloan-Kettering Cancer Center explain that Nigella sativa seeds may be beneficial in the treatment or prevention of high blood pressure, respiratory diseases, inflammation and cell damage, though additional research studies are necessary to substantiate these claims. Talk with your medical provider about the potential side effects of Nigella sativa before you begin using this natural supplement. Topical application of Nigella sativa may induce a side effect called contact dermatitis. After handling or applying Nigella sativa, you may develop red, irritated patches of skin across the site of treatment. The skin may also become dry or begin to flake or itch. Seek prompt medical care if you experience a severe skin reaction, such as oozing or painful blisters, after using this supplement. Oil extracted from Nigella sativa seeds may cause kidney or liver damage when used in high doses. These severe side effects of treatment were observed in rats given 2 grams per kilogram or more of Nigella sativa oil, according to MSKCC. Additional human research studies are necessary to further evaluate the effect Nigella sativa may have on the kidneys or liver; however, if you experience symptoms of kidney or liver damage, such as back or abdominal pain, urination changes, jaundice, fatigue or itchy skin, seek prompt care from your medical provider. The safety and efficacy of Nigella sativa have not been fully evaluated in pregnant women. Consequently, expectant mothers should not take Nigella sativa unless otherwise instructed by a medical professional, warns Dr. Michael Tierra with the American Association for the Advancement of Science. Talk with your doctor about any medication you are currently taking before you begin treatment with Nigella sativa. This supplement is an antioxidant and may protect cells against damage. The protective effect of Nigella sativa may interfere with the action of certain types of cancer therapies, such as radiation therapy or chemotherapy, which destroy cells that grow rapidly. Additionally, concomitant use of Nigella sativa and antihypertensive drugs may cause a sudden drop in your blood pressure levels, MSKCC warns. Low blood pressure, also called hypotension, may result in symptoms of dizziness, headache or fatigue.